Ergonomics | HUND MÖBELWERKE | Ergonomics in the office. 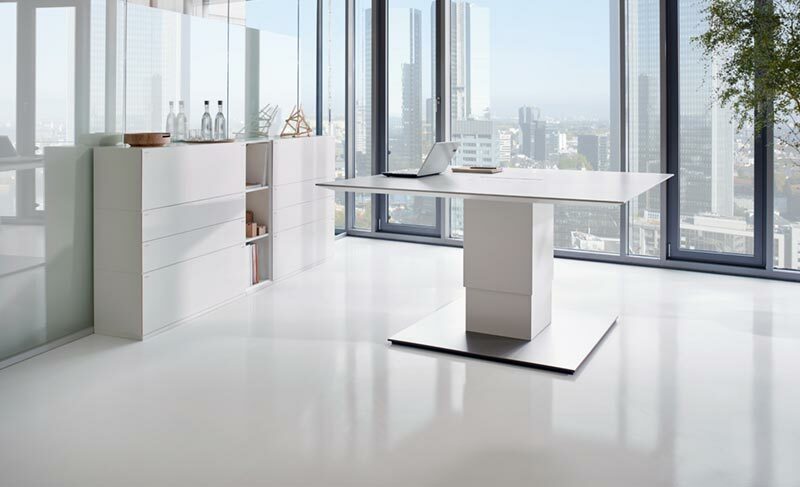 Ergonomics is far more than a chair or a desk which is well adapted to the user´s body. The physiological component is tremendously important, but still is only a part of ergonomics. Good ergonomics is about the workflow and processes at work and how they are managed and organized, including the human-machine interface (in offices mostly the interface between user and computer). A good and well-thought-out ergonomic office situation also includes a good colour concept. Colours have a proven effect on working productivity and the well-being in offices. The rising importance of digitization brings further challenges for ergonomics, especially in the field of the already mentioned human-machine interface. It’s essential to integrate the field of ergonomics already in the office space planning. The earlier, the better. The following part exclusively highlights now the physiological component. The Thales stand-or-sit for more ergonomics at the workplace. People who spend most of their work time sitting down, often complain about pain. The reason is often attributable to a lack of exercise, which can lead to a reduction of muscle activity, a strain of the intervertebral discs, and an impaired blood circulation. As frequently occurring discomforts, the German Federal Agency for Industrial Safety and Occupational Medicine (BAUA) mentions neck and head pain, neck-shoulder-arm-syndrome or shoulder and back pains. These health discomforts can be attributed, among other things, to an insufficient equipment and furniture, especially work desks and chairs, as well as and an unfavourable positioning of the keyboard and screen. For more ergonomic comfort at your workspace. Standing, sitting, walking. The success formula for a healthier way of working. Occupational physicians advise against spending more than 50% of the work time in a seated position. As part of the health promotion at the workplace, a dynamic alternation between the work performance in a standing and seated position is recommended approx. every 20 minutes. Frequent posture changes during the work will facilitate a good muscular blood circulation, a good supply of nutrients to the intervertebral discs, and thus also ensures a good oxygen supply to the brain. This requires a work place that also allows a frequent dynamic changing of the posture between sitting, standing and moving. The Thales stand-sit enables this recommended change of posture easily and conveniently through the tool-free quick height adjustment of the work table. This ergonomic solution can be used to actively counter physical inactivity and the inability to work. Design line for demanding work.